Temperature controlled laser for use in instrumentation. From 375nm to 1550nm. 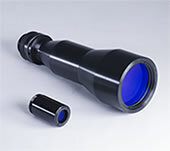 Circular beam lasers for use in instrumentation. Muon II Modules - New! Small self contained package. 405nm to 1064nm, up to 50mW output in a circular beam. Low cost. Copyright 2012-2017 Micro Laser Systems, Inc. All rights reserved.